Canvey Island turned out a dismal performance to lose 1-0 against Soham Town Rangers at The Frost Hire Stadium on Saturday. Both managers elected to keep the same starting XI from their previous matches which had seen them victorious. One new face on the Canvey bench was 18-year-old forward Lanre Balogun who signed before the game on work experience from Dagenham & Redbridge. Soham took the lead in the 10th minute when a cross from the left was trapped between the chest of Marlon Agyakwa and the back of an opponent. When the ball fell loose it was picked up by midfielder Ryan Auger who found the bottom corner from 20 yards, beating Harry Palmer diving to his left. Auger was in again eight minutes later when George Allen gifted possession to him with a loose pass. Auger raced towards goal but thankfully Harry Palmer spotted the danger and raced off his line to clear from just outside his area. Canvey had to wait until the 20th minute for their first sight of goal when Frankie Merrifield collected a flick on header from Adam Vyse following a ball into the box. Merrifield shot from a tight angle on the right which Lloyd Groves did well to deflect over the bar for a corner. The Gulls had several opportunities to take the lead in the the 29th minute. Sam Collins had two well-struck shots from the left beaten away by goalkeeper Josh Pope, with the ball staying out on the left wing. A cross was swung in which Adam Vyse headed back across goal for Martin Tuohy, but from close range and with only the keeper to beat Tuohy uncharacteristically snatched at the chance and stabbed the ball wide of the target. Canvey were awarded a penalty on 32 minutes when a cross was sent over from the left to the back post. Adam Vyse headed it back for James White who struck a powerful shot which hit the outstretched arm of a defender. 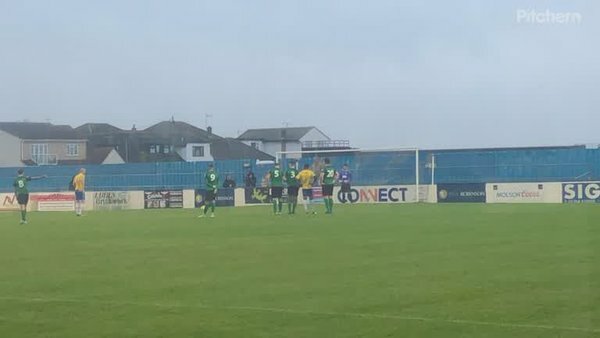 Martin Tuohy stepped up but saw his spot kick saved by Josh Pope diving to his right, with the penalty a good height for the keeper. The final chance of the first half came in injury time when Soham set off on the counter attack. Sam Mulready hit a curling left-footed shot from the edge of the box which Harry Palmer did well to turn wide flinging himself high to his right to produce the save. Manager Mark Bentley made two changes at the start of the second half, one tactical and the other enforced. Forward Lanre Balogun replaced winger Marlon Agyakwa at half time, with Josh Hutchinson coming on for Ryan Melaugh after only three minutes with the latter seemingly picking up a facial injury. Both sides had chances as the match approached the hour mark. First a good touch from Martin Tuohy allowed him to release Lanre Balogan with a through ball. The young forward was sent slightly wide but still managed to get his shot off from the right forcing Josh Pope into a save. Soon afterwards up the other end Jon Kaye saw a shot from a tight angle cleared off the line after he had beaten Harry Palmer to the ball. The ball was worked back out to Kaye on the right who swung in a dangerous cross which missed creeping in at the far post by a matter of inches when any touch would have resulted in a goal. Canvey failed to create another opportunity in the remaining half hour which was a sad indictment of a terrible performance from the Gulls.